Alpen Rose is set up beneath a barrel-vaulted ceiling at 116 S. 13th St.
After a string of big, splashy restaurants, Michael Schulson is going much, much smaller with a steakhouse called Alpen Rose, opening March 27 at 116 S. 13th St. It’s taken over the former video store and computer-repair shop on 13th Street south of Sansom, thus creating a true Schulson collective of three restaurants, including Sampan/Graffiti Bar and Double Knot. Schulson and wife Nina Tinari are going for an old-world experience emphasizing the art of butchering, which Schulson learned from his grandfather, who had a butcher shop in the Bronx. Alpen Rose’s beef is aged in-house from 14 to 120 days. And speaking of grandparents: Schulson said the name Alpen Rose is not a nod to the rhododendron but is a tribute to his grandmother, who kept a beautiful rose in a cup on an otherwise ordinary table. Menu, executed by chef Michael Le under Schulson culinary director Leo Forneas, includes steakhouse classics. Tinari said the dinner tab would be about $75 per person, including drinks. The 40-seater, a mere fraction of Schulson’s other joints including Giuseppe & Sons and Osteria, sits beneath a barrel-vaulted ceiling punctuated with crystal chandeliers. 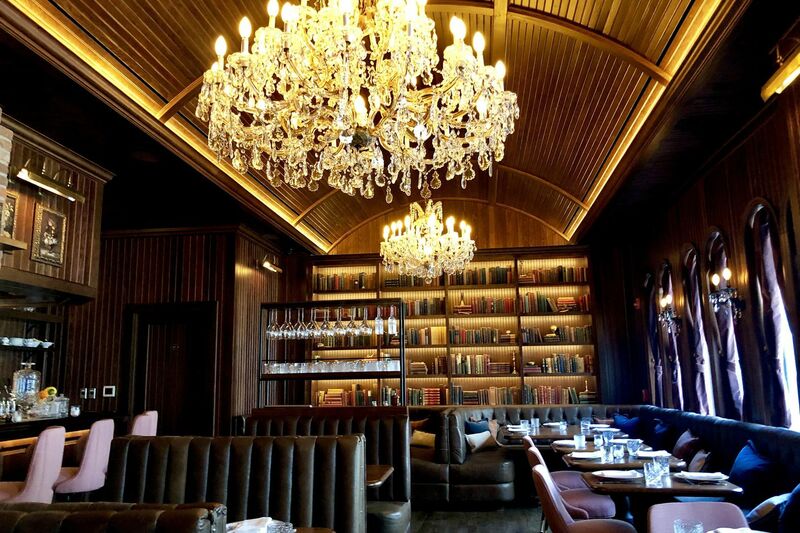 The wooden wall paneling and the collection of old photos and books tucked into the walls give it a rich feeling, vaguely reminiscent of Barclay Prime. Mixed china and cutlery give it a homespun charm. The open kitchen, by way of a wood-burning grill and hearth, is visible to much of the dining room. Tucked into one corner, just past the hearth, is a four-seat bar. It will be open nightly from 5 p.m.
Also still in the pipeline locally for Schulson: a restaurant on the 1700 block of Locust Street as well as two restaurants on the Camden waterfront. Schulson said no concepts have been decided. Glassware in the dining room at Alpen Rose.